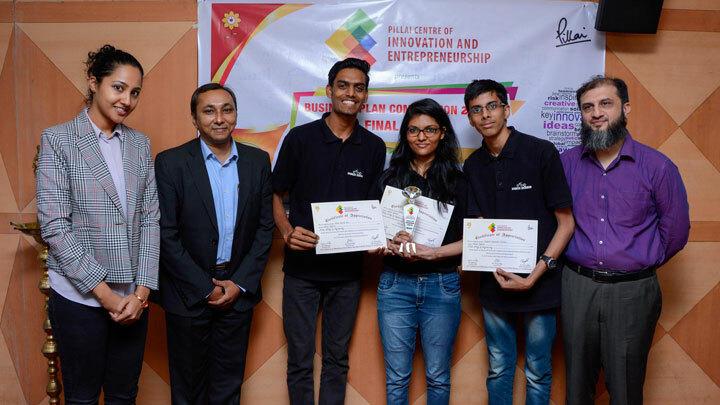 Five teams competed at the finale of Business Plan Competition 2018-19 held on 5th April, 2019 at the Conclave, Dr. K. M. Vasudevan Pillai Campus, Panvel. Team Indian Hybrid from Pillai College of Engineering, Panvel were adjudged the winners of the competition and were awarded prize money of Rs. 1 Lakh. The first runners up were Team Nustaa Chai from Pillai HOC College of Engineering, Rasayani and Second runners up were Team Solution Lifty Pvt. Ltd. from Pillai HOC College of Arts, Science and Commerce, Rasayani. The first runners up and second runners up were awarded prize money of Rs. 20,000 and Rs. 10,000 respectively. The competition was judged by Mr. Faisal Hawa, Mr. Bhavesh Kothari and Ms. Surabhi Rao. Mr. Faisal Hawa has had a career spanning 27 years in the kraft paper distribution business wherein H. G. Hawa & Co. now operates in 25 Cities of India and exports to over 10 countries. He also has a parallel investment career spanning 2 decades and has interests in both secondary markets and venture capital. His successes have been in 3 m, KNR Constructions, BVG India, Techfront and Bewakoof amongst others. He is also interested in seeding and mentoring businesses which solve life’s big problems and cater to the unserved markets and people. He believes firmly in innovation and always has a set of at least 20 big opportunities to be tapped through invention and ground breaking thought. Mr. Bhavesh Kothari is currently the Co-Founder and Chief Business Officer at Tapaswi Group Ventures LLP. He is also the Head – Mumbai Bureau & a Columnist at SME WORLD Magazine. He actively mentors start-ups in various areas of their business such as strategy, business management, sales & marketing, funding, etc. Over the past 9 years, he as Mentored more than five dozen start-ups in the domains of Healthtech, Blockchain, IoT, Adtech, Gaming, E-Commerce, FoodTech and Education. Ms. Surabhi Rao is the Director and Product Development head of her family business, Narsipur Chemicals Pvt. Ltd. Surabhi, a second generation entrepreneur started with heading the Quality Control department and is now involved in product design and development as well. Other than being an active Director at Narsipur Chemicals, she is also in the process of establishing herself as an Image Consultant and grooming expert. She was the winner of the Femina Miss India subtitle Miss Divine Thoughts in 2011. The teams were mentored by Dr. Priam Pillai, Ms. Munawira Kotyad Pillai, Dr. Celina Joy and Ms. Susanna Cherian.